After suffering a stomach bleed, Diego Maradona underwent successful surgery in Buenos Aires. 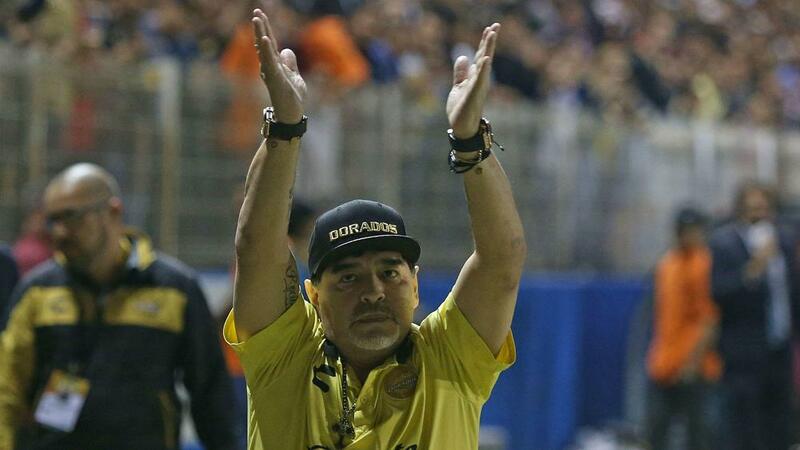 Diego Maradona has thanked hospital staff after undergoing successful surgery. Maradona's lawyer confirmed on Sunday that the 58-year-old, who is currently coach of MX Clausura side Dorados, had had surgery in Buenos Aires, having been hospitalised after suffering a stomach bleed. "Diego Maradona's surgery has finished. Thank God everything went perfectly," Matias Morla wrote on Twitter. "A thank you to the medical department of Clinica Olivos for your professionalism and humanity. "Now we're waiting for the recovery so Diego can return to work as soon as possible." And, in a post on his official Instagram account, Maradona also thanked staff at Swiss Medical and Clinica Olivos for his care. Maradona posted: "I want to thank Swiss Medical and Clínica Olivos for the excellent care, and my doctors Leopoldo Luciano Luque, Ariel Sainz, and the team that accompanied them: Walter Godoy, Carlos Becerra, Sebastian Nani and Pablo Dimitroff. Thank you all!!!"